I’ve written before (link) about the impact of SD-WAN on fixed (enterprise) operators, where it is having significant effects on the market for MPLS VPNs, allowing businesses to bond together / arbitrage between normal Internet connection(s), small-capacity MPLS links and perhaps an LTE modem in the same box. Now, similar things are being seen in the mobile world. This is the "multi-network" threat I've discussed before (link). Sometimes provided through a normal CSP, and sometimes managed independently, SD-WAN has had a profound impact on MPLS pricing in some corporate sectors. It has partly been driven by an increasing % of branch-site data traffic going into the HQ network and straight out again to the web or a cloud service. That “tromboning” is expensive, especially if it is using premium MPLS capacity. The key enabler has been the software used to combine multiple connections – either to bond them together, send traffic via differential connections based on type or speed, add security and cloud-management functions, or offer arbitrage capabilities of varying sorts. 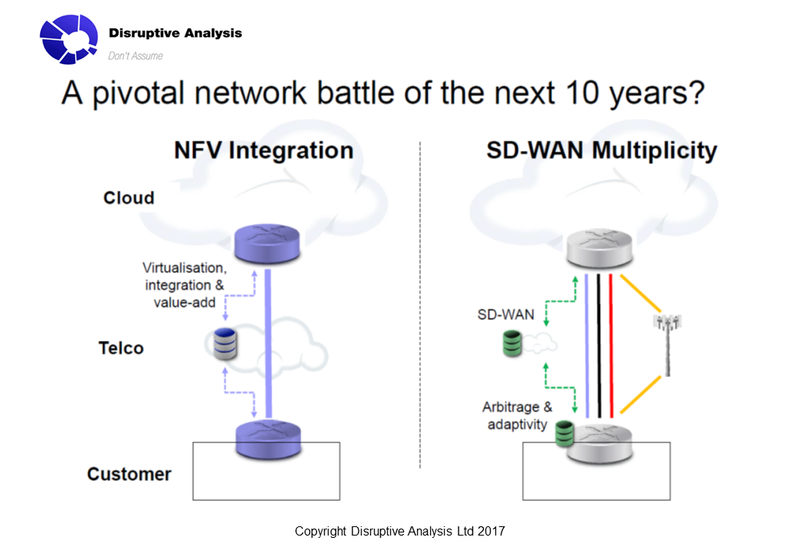 It has also disrupted network operators hoping to offer NFV- and SDN-services alongside access: if only a fraction of the traffic goes through that operator’s core, while the rest breaks-out straight to the Internet, or via a different carrier, it’s difficult to add valuable functionality with network software. But thus far, the main impact has been on business fixed-data connections, especially MPLS which can be 30-40x the cost of a “vanilla” ISP broadband line, for comparable throughput speeds. 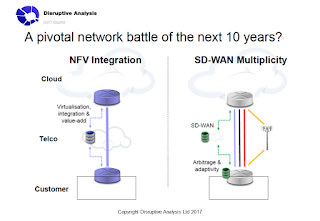 Many network providers have now grudgingly launched SD-WAN services of their own – the “if you can’t beat them, then join them” strategy aiming to keep customer relevance, and push their own cloud-connect products. Typically they’ve partnered with SD-WAN providers like VeloCloud, while vendors such as Cisco have made acquisitions. 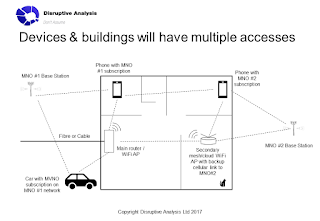 I’ve been wondering for a while if we’d see the principle extended to mobile devices or users – whether it’s likely to get multiple mobile connections, or a mix of mobile / fixed, to create similar problems for either business or consumer devices. It fits well with my broader belief of “arbitrage everywhere” (link). Up to a point, WiFi on smartphones and other devices already does this multi-connection vision, but most implementations have been either/or cellular and WiFi, not both together. Either the user, the OS, or one of the various cellular hand-off standards has done the switching. This is now starting to change. We are seeing early examples of mobile / WiFi / fixed combinations, where connections from multiple SPs and MNOs are being bonded, or where traffic is intelligently switched-between multiple “live” connections. (This is separate from things like eSIM- or multi-IMSI enabled mobile devices or services like Google Fi, which can connect to different networks, but only one at a time). The early stages of mobile bonding / SD-WAN are mostly appearing in enterprise or IoT scenarios. The onboard WiFi in a growing number of passenger trains is often based on units combining multiple LTE radios. (And perhaps satellite). These can use multiple operators’ SIMs in order to maximise both coverage and throughput along the track. I’ve seen similar devices used for in-vehicle connections for law enforcement, and for some fixed-IoT implementations such as road-tolling or traffic-flow monitors. At a trade show recently I saw the suitcase-sized unit below. It has 12 LTE radios and SIMs, plus a switch, so it can potentially combine 3 or 4 connections to each network operator. It’s used in locations like construction sites, to create a “virtual fibre” connection for the project office and workers, where normal fixed infrastructure is not available. Usually, the output is via WiFi or fixed-ethernet, but it can also potentially support site-wide LPWAN (or conceivably even a local private unlicensed/shared-band LTE network). It apparently costs about $6000 or so, although the vendor prefers to offer it as a service, with the various backhaul SIMs / data plans, rather than on a BYO basis. Apparently other similar systems are made by other firms – and I can certainly imagine less-rugged or fewer-radio versions having a much lower price point. But what really caught my eye recently is a little-discussed announcement from Apple about the new iOS11. It supports “TCP Multipath”. (this link is a good description & the full Applie slide-deck from WWDC is here). 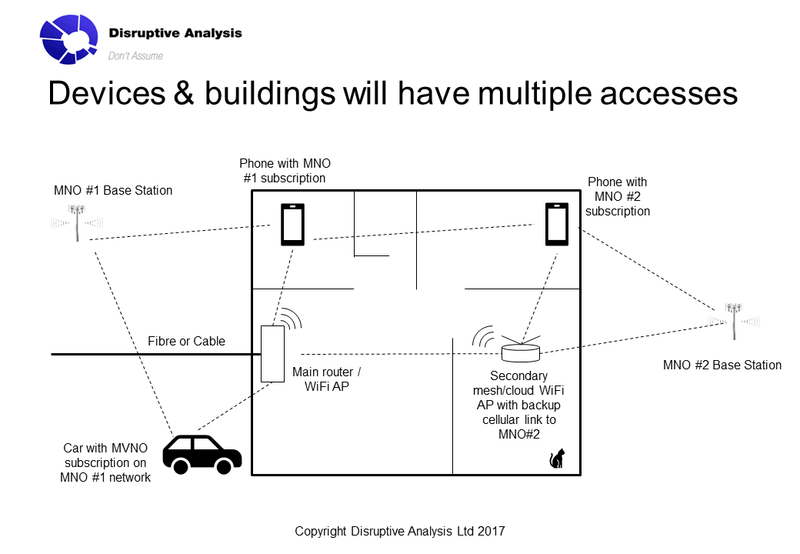 This should enable it to use multiple simultaneous connections – notably cellular and WiFi, although I guess that conceivably a future device could even support two cellular radios (perhaps in an iPad with enough space and battery capacity). That on its own could yield some interesting results, especially as iOS already allows applications to distinguish between network connections (“only download video in high quality over WiFi”, etc).It also turns out that Apple has been privately using Multipath TCP for 4 years, for Siri - with, it claims, a 5x drop in network connection failure rates. The iOS11 APIs offer various options for developers to combine WiFi and cellular (see slide 37 onward here). But I’m also wondering what future generations of developer controls over such multipath connectivity might enable. It could allow novel approaches to security, performance optimisation on a per-application or per-flow basis, offload and on-load, and perhaps integration with other similar devices, or home WiFi multi-AP solutions that are becoming popular. Where multiple devices cooperate, many other possibilities start to emerge. What we may well see in future is multi-device, multi-access, P2P meshes. Imagine a family at home, with each member having a subscription and data-plan with a different mobile network. Either via some sort of gateway, or perhaps using WiFi or Bluetooth directly between devices, they can effectively share each others’ connections (and the fixed broadband), while simultaneously using their own “native” cellular data. Potentially, they can share phone numbers / identities this way as well. An advanced connection-management tool can optimise for throughput, latency or just simply coverage anywhere in the house or garden. This could have a number of profound implications. It would lead to much greater substitution between different networks and plans. It would indirectly improve network coverage, especially indoors. It could either increase or decrease demand for small cells (are they still needed, if phones can act as multi-network relays? Or perhaps operators try to keep people “on net” and give them away for free?). From a regulatory or law-enforcement standpoint it means serious challenges around identifying individual users. It could mean that non-neutral network policies could be “gamed”, as could pricing plans. Now I’ll fully admit that I’m extrapolating quite a bit from a seemingly simple enhancement of iOS. (I’m also not sure how this would work with Android devices). But to me, this looks analogous to another Apple move last year – adding CallKit to iOS, which allowed other voice applications to become “first-class citizens” on iPhones, with multiple diallers and telephony experiences sharing call-logs and home-screen answerability. 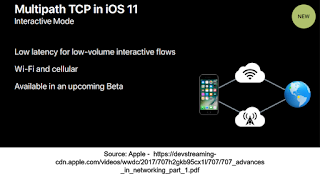 Potentially, multipath in iOS allows other networks to become (effectively) first-class citizens as well as the “native” MNO connection controlled from the SIM. I’m expecting other examples of mobile connection-bonding and arbitrage to emerge in the coming months and years. The lessons from SD-WAN in the fixed domain should be re-examined by carriers through a wireless lens: expect more arbitrage in future.